Curried Spaghetti Squash is a new side dish to serve alongside your tried-and-true chicken or steak recipe. It’s healthy and bursting with curry flavor. 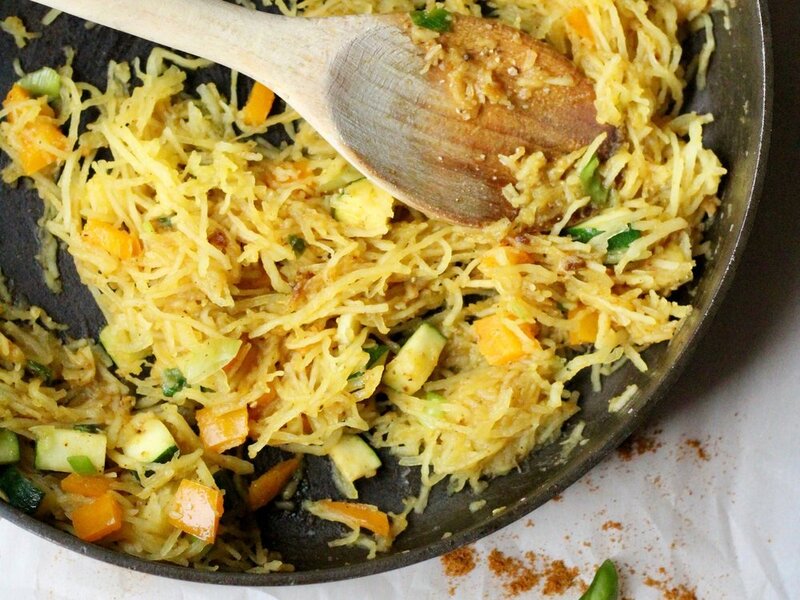 It seems like I’ve tried every spaghetti squash recipe under the sun—and then I discovered curry. Why not marry the two? Curried Spaghetti Squash is a twist on the classic spaghetti squash recipes that brings a whole new flavor profile to the dish. The best part? It’s around 60 calories per cup! Cut the spaghetti squash in half and scoop out seeds. Season with salt and pepper and place face down on a baking sheet covered in aluminum foil. Bake squash for 30 minutes. Remove from the oven and set aside to cool. When cool enough to handle, take a fork and separate the flesh from the squash into strings. For a faster dinner, do this step the night before and store squash in an airtight container in the fridge. Over medium-high heat, add 1 tablespoon of olive oil and sauté the zucchini and orange bell pepper until slightly soft (about 3-4 minutes). Set aside. In the same pan over medium high heat, add the rest of the olive oil. Add the ginger and curry powder and stir until fragrant. Stir in the lemon juice and honey. Season with salt and pepper to taste. Add the zucchini, orange bell pepper, and strands of spaghetti squash and stir until well coated. Garnish with green onions and fresh basil.